Replacing hard work and expensive analytics to solve mysterious production problems, Invantest customers use automatic, intelligent systems to avoid problems and production losses. When an exception occurs, Invantest cell controllers stop the equipment, trigger a production alarm, and display a predefined Out-of-Control Action Plan (OCAP) for immediate correction. Invantest technology gives its customers a competitive advantage. Semiconductor companies prefer to do business with test subcontractors that consistently provide high production yields, deliver ahead of schedule, and avoid costly quality escapes. Instead of relying on people to perform perfectly all the time, Invantest builds perfection into its automatic, intelligent systems that control production processes so that they are executed flawlessly and reliably all the time, 24 x 7. 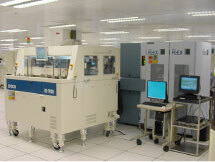 Known weaknesses in existing production processes are eliminated by simply turning on Integrator WaferTest (IG.WT) tiling algorithms to minimize the number of probe touchdowns or by turning on Integrator FinalTest (IG.FT) inline, selective retest to automatically perform retest during first pass testing or by turning on the many other automatic production solutions built into Invantest's suite of controllers. Automatic Test Equipment, probers, and handlers are expensive capital assets that weigh down gross margins. The easiest way to boost gross margins is to maximize the productive utilization from existing equipment currently running on test floors. To boost equipment efficiency, Invantest offers a next generation Integrator Operations (IG.Ops) equipment tracking controller that communicates with Invantest cell controllers to provide accurate and reliable measures of efficiency losses. Efficiency Analyzer applications in Invantest's Production Dashboard reveal the root causes of these inefficiencies for immediate corrective action. The mission of this integrated system is rapid and sustainable increases in Overall Equipment Efficiency that lead to higher gross margins. A test floor cannot be effectively managed with engineers chasing production issues (fire fighting) on the test floor and out of reach of managers. Using Invantest's Web Dashboard with its Virtual Test Floor, managers can effectively manage production activities from a conference room (control center) with their key staff. Invantest controllers running at test cells are automatically updating vital production information in the DashBoard in near real-time so that managers can react immediately to any unexpected changes in daily operations. An Invantest-driven control center makes it easy to meet daily goals that lead inevitably to monthly gains, quarterly gains, and yearly gains and bonuses.